Nox sat on top of a gravestone, her feet swinging in time to the music coming down from the mansion. Every year her father, the Lord of Ice, held a Wintertide ball for all the nobles beholden to the House of Ice. At any other time she would have been stuck inside, playing hostess until the wee hours of the morning. Not this year, however. She had put aside her fancy gown and jewelry for more practical traveling clothes. “I wouldn’t have gotten to dance anyway. I turned eighteen this autumn,” she said, her heels still tapping against the cold stone. “Oddly enough, mother said the same thing. Had a real row with father – Why are you endangering our only child for a pointless ritual?” Nox said, mimicking Serenna’s strident tones. “I will watch for your return,” the ancient guardian said, making the cookie disappear just before fading out himself. She stopped at the river’s edge and ran a hand over the soles of her boots, forming skates out of ice. The river itself was eerily silent. She could sense the turbulent water surging below its frozen surface, but the ice was so thick it muffled the noise. The only sounds were the occasional creak of tree limbs shedding snow, and the whisper of her skates as she glided along. The lights of the mansion soon disappeared behind her, leaving her with only the pale illumination of the moon. Two miles passed beneath her feet before the frozen river curved around a sharp bend. Nox whistled, and a chilly breeze curled around her, leaving ice crystals hanging in the air. The moonlight refracted through them, lighting the night more brightly. She only kept them aloft for a few moments, however, just long enough to find the path that led up to the mountain pass. There were creatures in the mountains that obeyed no laws, and would consider her a tasty dinner if she made herself too easy to track. The path led steeply upwards, winding through tall marker stones that were covered in elemental casting marks. Some were so old that the lines were nearly worn away, and Nox paused a few times to take a closer look. A few were protective enchantments, and others kept the path clear. Most were unreadable, however, and she gave up and moved on. Soon the path turned into stairs, and then it became little more than handholds in the rocks. Nox pulled a special set of gloves out of her pocket and tugged them on. More casting marks were embroidered on them, her own handiwork, and they gripped the slippery stone as if covered in glue. They could not add strength to her slender arms, however, and she was trembling from the effort by the time she got to the top. A cave sat off to the side of the trail, and Nox rested by its entrance until she caught her breath. “What were our ancestors thinking?” she grumbled. “Rock climbing is for Stone kindreds.” Eventually she got up, straightened her clothes and patted her hair into place. If she had to meet with the spirits of her ancestors, she at least wanted to make a good first impression. The cave was filled with icicles, hanging in ranks like an inverted pipe organ. Nox reached up to flick one, and it rung like a bell. A grin split her face – how many times had her mother forbidden her to do just that, fearing that the decorative ice flows around the mansion would fall on her head? “She’s not here now, and father said to follow my instincts.” Nox tapped a few more, filling the air with shimmering sound. “I wonder if they’re hollow? Only one way to find out.” She took a deep breath, and sang out a pure, clear note. A chorus of sound answered her. There were deep, resonant tones that she could feel through the soles of her feet, and flute-like harmonies swelled around her, along with high, piercing notes that filled her head. She tried singing different notes, playing with the harmonies until she could almost get the chamber to sound like a choir in full voice. She was just dipping down into the lower registers when a dissonant noise rattled the chamber. Nox let the song die out, but the rumbling persisted. She cautiously poked her head out of the cave, and looked up the pass. A wall of white moved towards her, splitting around the enchanted trail. The cave, however, had no such protections, being slightly off the path. More ghosts were appearing, all of them with the black hair and blue eyes that were the hallmark of her family. They were all taller than her, however. Nox took after her mother in height, much to her endless annoyance. “End me? You and what army?” Nox said, crossing her arms. Nox shoved Lughaid away from her, and turned to face the latest arrival. The ghost was so old he could barely materialize, and she could not make out enough of his features to recognize him. Which meant she could not bind him. Even so, she drew herself up to her full 4’ 10”, and tried to look as imposing as possible. “Be at ease, my dear. I mean you know harm,” he said, as if reading her mind. Who knew, maybe he could, Nox thought. The shade reached an arm out, but she could not see his hand. She felt it though, the cold, bony fingers tilting her chin up. Nox caught a glimpse of the other ghosts out of the corner of her eye. They had all backed away, and bowed their heads in respect. Just who was this spirit? She pulled a small pellet of ice out of her pocket. Tiny elemental casting marks were carved into it, and as she blew on it, it started to unfold. Petals flowed outwards, and feathery fronds uncurled from the center. Once it was done, she held a perfect replica of a frost flower in her hand, carved out of ice. He reached out to touch the flower, and lines of force flowed over it, etching new patterns. The petals changed, becoming pliant as if they were real, and took on all the colors of ice. They were black on the tips of the petals, and changed to shades of blue and white as the colors washed into the center. Veins of clear, glittering crystal spread over them in a web, and made up the fronds in the center as well. With a howl of wind straight from the heart of Winter, the ghosts ripped around the cave and smashed the snow out of the entrance. Nox ran after them, and found that an easy path had been carved into the snow. All along its length her flowers bloomed, glimmering in the moonlight. The trip back down the mountain went much more quickly, and the North Wind pushed her at breath-taking speeds along the frozen river. Nox had never moved so fast in her life, but she loved every minute of it. As she made her way off the river and up the road to the mansion, she could see more flowers festooning every door and window, and there were even some hanging from the gate to the graveyard. “I did it. I actually did it!” Nox said. H’ray! 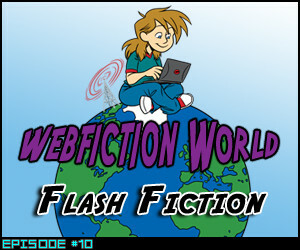 The lovely folks at WebFiction World were kind enough to invite me to discuss the merits (and problems) that come with writing a webseries. Also featured was the talented John Wiswell, author of many wonderful and strange flash fiction stories. 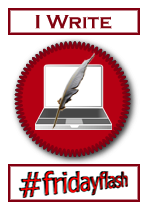 I also got to talk about Nox and Grimm, a paranormal espionage novel that’s in the works, and a bit about the #fridayflash community. Nox hated having dinner with her mother. Neither of them particularly enjoyed the others’ company, but Serenna always insisted on at least a half hour of “civilized conversation” before she would get to the point. So Nox pushed her food around her plate and made a pretense of eating, while listening to her mother’s inane small talk. At least she had convinced her to have dinner in the solarium, which was less stuffy than the other, more formal dining rooms. The only thing that made the dinner bearable was Grimm. The hound was sprawled on the floor next to Nox, using Air castings to waft bits of meat up to his mouth. He made each piece do a loop-de-loop before gleefully snapping it up. Grimm tilted his head to the side. “You told Nox that you did not want me slobbering on your fine china. So I am not.” He sent the t-bone from his steak spiraling upwards, and bit into it with a loud crunch. “In private,” Serenna said, still glaring at the hound. “You have grown since then. Your cure for the firethorn proved that you can reach beyond your current skill level, even if the methods you used were, unconventional,” Serenna said, her lips curling in distaste around that last word. “She is Air. All of the Wind kindreds had the healing gift, so it is only natural,” Grimm rumbled. “Yes, what have you been doing about that, Mother?” Nox said. Her voice was calm, but the temperature in the room dropped to match the icy chill of her gaze. “No, she was nervous before you started growling at her.” Nox thumbed through the pile of books. “Well, at least we got something useful out of this visit. I’ve seen most of these before, they shouldn’t be too hard to use. This one’s new though.” The book looked fragile, its binding cracked and the pages brittle. She ran a finger along a page, then jerked her hand back. “Ow!” she yelped, and let out a few choice words. “Not by my plans. You will end this now!” Serenna snarled and began a banishing spell. “You’re probably right,” Nox said, and ran a finger along some of the markings that were carved into the stone frame of the portal. A light breeze flowed in, stirring the dust enough to make her sneeze again. “Cover your face,” Grimm said. He let out a low woof, and a gust of wind scoured the room clean. She snatched up the lantern and scooted to his side. “What did you hear,” she whispered. “Not till we find out who’s poking around up there. If someone is using part of the Wind territories as a base for troops, I want to know.” She pulled a bow out of her satchel and unfolded it. A touch to the enchantments carved in the wood caused a line of force to string itself along the pulleys at either end, and bent the risers back in a wicked curve. A crystal hung suspended along the line, and an arrow made of ice formed as she took aim. “Here they come,” Grimm growled. Time always seemed to defy logic when Nox found herself on the edge of battle. Everything happened in an eyeblink, and yet she was acutely aware of every action, as if it was all moving in slow motion. The stone covering the top of the stairs ground open with a roar of effort from the men above. A blinding white light and a wave of energy filled the room, only to be met by Nox’s electric blue aura. A blast from the depths of Winter screamed toward them, only to be deflected by the cyclone winds of Grimm’s howling defensive shield. Arrows leapt from Nox’s bow towards the shadowy figures dropping through the opening, but were shattered against their crystalline skin. Nox blinked in shock as she realized that they were Ice kin. She yelled, “HOLD!” at the same time as their leader. Nox had never seen her father look so furious. She sent warm thoughts to the hound to thank him. Nox sighed as several of the guards spread out around the room. He wasn’t going to let go of this little gaff so easily. Then again, with the Morning Lord using portals to invade his neighbors the caution was not unwarranted. “I’ll be right back,” she said, and hurried off through Zephyra with Grimm at her heels.